Vamos a Leer is a monthly book club meeting at Bookworks that reads and discusses literature of Latin America. Teachers, students, and other readers interested in Latin American literature are welcome to attend. For an event flyer featuring 2013-2014 reading selections, visit the Vamos A Leer website. March's selection is The lightning dreamer: Cuba's Greatest Abolitionist by Margarita Engel. "I find it so easy to forget / that I'm just a girl who is expected / to live / without thoughts." Opposing slavery in Cuba in the nineteenth century was dangerous. The most daring abolitionists were poets who veiled their work in metaphor. Of these, the boldest was Gertrudis Gomez de Avellaneda, nicknamed Tula. In passionate, accessible verses of her own, Engle evokes the voice of this book-loving feminist and abolitionist who bravely resisted an arranged marriage at the age of fourteen, and was ultimately courageous enough to fight against injustice. Historical notes, excerpts, and source notes round out this exceptional tribute. Meet a young dog who is a graduate of sniffing school—a dog who is happy to help if you get lost! your invisible trail . . . This cozy story gently teaches children what to do if they lose their way, and reassures them that a search-and-rescue dog can find them wherever they are. And once a child is found, the dog will bring people to make sure that everyone gets home safe and sound. Full of interesting facts about search-and-rescue dogs and tips for young children in case they get lost, Margarita Engle's When You Wander is a fascinating peek into the world of these amazing dogs and the children they save. ENCHANTED ADULTS is our in-store book club for adults who love children's books. All meetings take place on the fourth Tuesdays of the month at 7 p.m., unless otherwise noted. Sessions are approved for continuing education standard credit by WCPSS. The group takes June and July off. 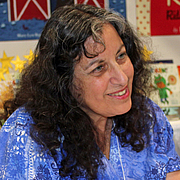 Margarita Engle is currently considered a "single author." If one or more works are by a distinct, homonymous authors, go ahead and split the author. Margarita Engle is composed of 3 names. You can examine and separate out names.